1. Preheat the oven to 190°C, gas mark 5. Place a large baking sheet in the oven to heat up. Lightly flour a work surface and roll out the pastry to a circle roughly 40cm in diameter and the thickness of a £1 coin. Slide onto a piece of baking parchment. 2. Whisk together the egg yolk and double cream and brush all over the pastry. Fold the edge of the pastry over to make a crimped border at least 2cm wide. Brush the border with a little of the egg wash, prick the base with a fork and chill while you prepare the almond filling. 3. Tip the almonds, egg, caster sugar, butter, vanilla, lemon juice and a pinch of salt into a food processor and pulse until smooth. Spread the mixture over the pastry and chill for 15 minutes. 4. 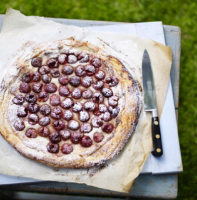 Arrange the cherries over the almond filling and sprinkle with 1 tbsp caster sugar. Lift the tart on the baking parchment and carefully transfer to the hot baking sheet. Bake for 25–30 minutes until the pastry is golden. Cool slightly before dusting with icing sugar and serving with cream, if liked.